Hey! That's the book on the t.v.! And I made that cake! To see the clip, click here. I had a great time making caking magic on The Talk today. I wanted to share the clip and the recipe with everyone. This turns out to be fortuitous because there was a glitch in the printing matrix and a chunk of the recipe procedure was left out of the book. So now I'm sharing the recipe in it's ENTIRETY here! For an in depth photo tutorial of how to assemble the cake, you can find it in the pages of Bake It Like You Mean It. 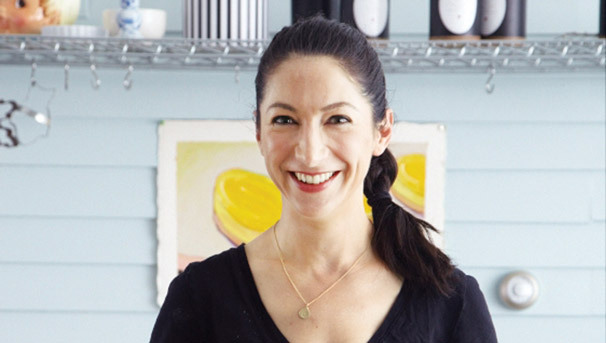 Pastry chef and author, Gesine Bullock-Prado, visited "The Talk" for a Talk Takeaway: Cooking segment. She showed the ladies how to make delicious, decadent desserts. Here are the recipes! Preheat oven to 400º. Line a half sheet pan with parchment. Do not spray with non-stick spray. In the bowl of a food processor fit with the blade attachment, combine the 2 egg whites and almond paste. Process until the two are combined and the almond paste is soft. In the bowl of a stand mixer fit with the whisk attachment, combine the egg yolks and 1/4 of the sugar and beat until the mixture thickens but isn’t stiff. Switch to the paddle attachment and add the almond paste mixture a small bit at a time to avoid getting lumps. Transfer this mixture to a mixing bowl and clean the stand mixer bowl and whisk attachment thoroughly. In the clean bowl of your stand mixer, combine the 6 egg whites and salt. Whisk until the egg whites become white and foamy. Slowly add the remaining sugar and whisk until the egg whites form stiff peaks. (Be careful not to whip to the point that they become chunky and dry.) Fold 1/3 of the egg white mixture into the egg yolk mixture to lighten. Add the remaining whites and gently fold until the two are incorporated. Whisk together the flour and cocoa. Sift the flour mixture over the egg mixture and fold together with a large rubber spatula. Spread the batter onto the prepared sheet pan in a very even layer. Bake for 10 minutes or just until it springs back when gently poked. In a heavy saucepan, combine the granulated sugar with 1⁄4 cup (60 ml) water and stir constantly over medium heat until the sugar has completely dissolved. Stop stirring. Attach a candy thermometer to the side of the saucepan and cook until the sugar syrup reaches 240°F (116°C). Meanwhile, in the bowl of a stand mixer fitted with the whisk attachment, combine the eggs, vanilla bean paste, and salt. Whisk until the eggs are broken. 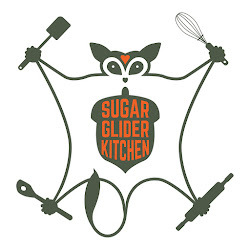 When the sugar has reached 240°F (116°C), continue whisking the egg mixture on medium speed and slowly pour the sugar syrup in a slow stream down the side of the mixing bowl. Once all the sugar is added, increase the speed to high and whip until the bowl is cool to the touch. Reduce the mixer speed to medium-low and add the butter, a few cubes at a time, until it has all been incorporated. Transfer a large spoonful of this mixture to the melted chocolate and stir vigorously until incorporated. With the mixer running on medium speed, add the chocolate to the remaining buttercream mixture. In a saucepan, combine the granulated sugar with 1 cup (240 ml) water and stir over medium heat until the sugar has completely dissolved. Let cool slightly. Once the cake has cooled, use a pastry brush to gently brush off the top “skin” of the cake. 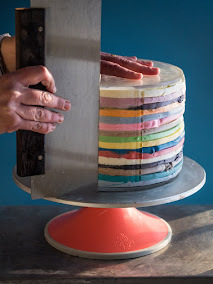 Trim the edges of the cake, then divide the cake into 4 even strips, each approximately (or slightly less than) 4 by 12 inches (10 by 30.5 cm). Transfer a cake layer to a serving platter. 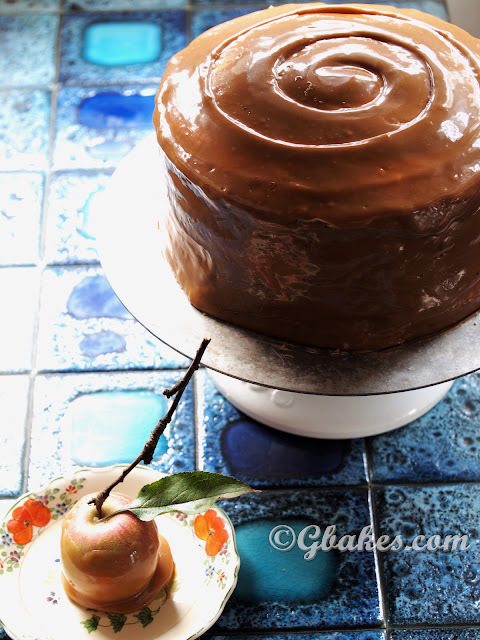 Using a pastry brush, brush a layer of simple syrup over the entire cake surface. Spread a thin layer of buttercream over the sponge layer, spreading it as evenly as possible, about 1⁄4 inch (6 mm) thick. Top the buttercream with the second cake layer, pressing gently to adhere. Brush with simple syrup and spread with buttercream. Continue layering with cake, simple syrup, and buttercream until the fourth layer is applied. Cut the cake in half lengthwise. Spread an even layer of buttercream on top of one half and place the second cake half on top so you are left with 8 cake layers. Wrap the cake in plastic wrap and freeze until very firm, about 1 hour. Trim any uneven sides off the cake: Dip a long, very sharp serrated knife in scalding water and dry it off. 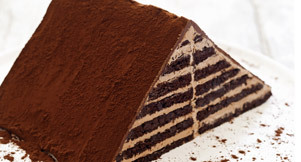 Cut the cake in half diagonally, forming two long triangles. Flip the triangles so that the uncut sides are facing each other. Spread a thin layer of buttercream along one of the uncut sides, then press the two uncut sides together, with the buttercream acting as glue. You’ve now created a triangle. Cover the cake with plastic wrap and refrigerate for 1 hour. Place the chocolate in a medium mixing bowl. Bring the cream and butter to a simmer in a small saucepan over medium heat, then pour the cream mixture over the chocolate. Allow it to sit undisturbed for 2 minutes, then whisk until smooth. Place the cake on a cooling rack. Spread the glaze over the cake with a small offset spatula. Sift the cocoa powder evenly over the cake to coat the glaze.